The Coe College Heritage Club was inspired by eleventh President Joseph E. McCabe and exists to recognize and honor those who have included Coe College in their estate plans or other planned gift. 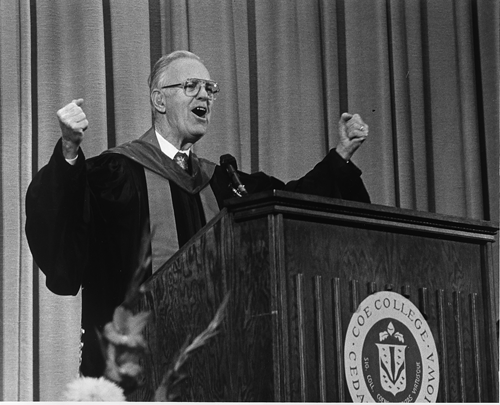 On June 11, 1993, President McCabe delivered his A Night to Remember address to the charter members of the Heritage Club. He exclaimed, "The future is ours if we have the vision to seize it." Planned gifts are formal plans to provide future support to the college. This can be accomplished many different ways including naming Coe in your will or trust, by naming Coe as beneficiary on a retirement account or life insurance policy or giving us a qualified life insurance policy. Special gifts that pay you income for life, such as charitable gift annuities, also make you eligible for membership in the Heritage Club. If you have created a planned gift for Coe College, we would like to take this opportunity to thank you. Whatever your gift, know that it is much more than a sum of money or other assets - it represents your values and priorities and a lifetime of hard work. And always, these gifts enrich the educational opportunities for current and future students and provide the college with financial stability. Membership in the Heritage Club is simple and easy. If you have made a planned gift of any kind and of any size to Coe College, then you are eligible for membership. All you have to do is let us know. We will work with you to make sure we understand your goals and intentions and make certain that your gift is used in the way you intend. The purpose of the Heritage Club is to serve and recognize you. We want you to know how much we appreciate your decision to give and how your gift impacts Coe College. While we hope that your generosity will inspire others, you can remain anonymous for recognition purposes if you choose. Each year members of the Heritage Club gather together with President McInally for an appreciation dinner during Homecoming Weekend, and membership is permanently recorded on the plaques located in Clark Alumni House. Additional benefits include invitations to special events, insider communications and participation in personalized tours. We will be in touch with our members about these upcoming events and certainly hope that all will be able to join us. The greatest benefit, of course, is the satisfaction of knowing you have meaningfully contributed to the continued excellence of Coe College and have made an impact on the lives of our students.